Rogue Waste is committed to air quality improvements here in the Rogue Valley. 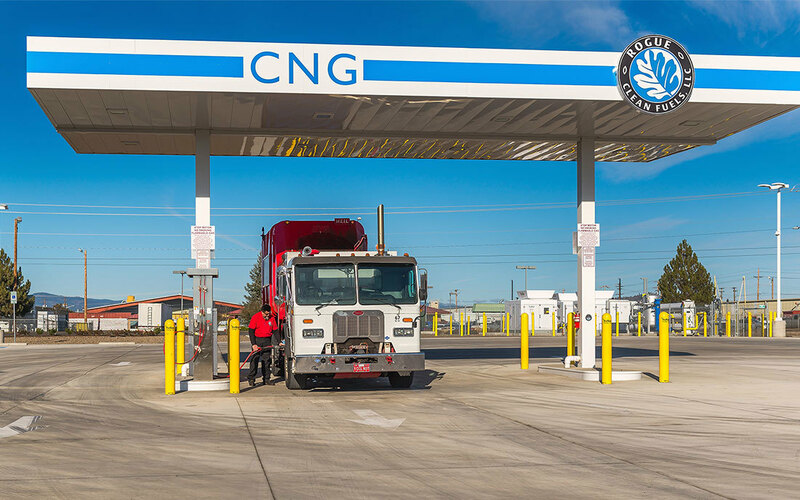 One of the ways we do that is by converting the trucks in our fleet to run on clean-burning Compressed Natural Gas (CNG) — and opening one of just a handful of CNG fuel stations in the state. And plans are underway to refine biogas at the Dry Creek Landfill into an even cleaner — and renewable — transportation fuel known as Renewable Natural Gas (RNG). But there are simple, everyday things you can do too. Things that can help reduce air pollution right here at home. Cars do more than just add to the problem. The making of gasoline requires the burning of coal and oil, which causes an increase in sulfur dioxide, another leading cause of air pollution. So the more time spent behind the wheel of a car means more air pollution. Even though it’s not realistic to stop driving, there are simple things you can do to help. Instead of making separate trips to the grocery store, the post office and the bank, consolidate your stops into one trip. If it’s possible to take the bus, carpool with coworkers or ride your bike, do so. When it’s time for a new car, consider a hybrid or electric model. And keep your car tuned up and your tires properly inflated. The average American spends more than 90% of their time indoors. And while you may think of pollution as an outdoor issue, it exists indoors too. Furnishings, finishes, upholstery, synthetic building materials and cleaning products in homes and offices can emit a variety of toxins, including formaldehyde, ammonia, benzene and xylene. Indoor air pollution can also be caused by pollen, bacteria, dust and mold. Sometimes outdoor air pollution — like car exhaust — finds its way inside. And all of these are made worse in small or poorly ventilated spaces. Air contaminants in homes and workplaces can cause “sick building syndrome” — which can cause everything from headache, dizziness and nausea to eye, ear and throat irritation. Fortunately, the scientists at NASA have discovered an easy, beautiful and all-natural way to help — using houseplants to clean the air. Plants absorb some of the particulates from the air as they turn carbon dioxide into oxygen through photosynthesis. Microbes in the potting soil also help with the cleaning effect. Gerbera Daisy, Peace Lily, Spider Plant, Garden Mums, Boston Ferns, Ficus, Dracaena, Bamboo Palm and Aloe Vera can all help clean the air at home or at work. Today’s solar panels are unique, both in design and installation. In the past, solar panels were large and unsightly, perched high above your roof. Modern versions are colorful, install directly onto your roof, and can usually generate enough electricity to power your home, heat your hot water and have enough left over to sell back to the utility company. A solar power system at the Transfer Station allows us to convert sunlight into energy, providing renewable power to our customer service center — with no air pollution, hazardous waste or noise. Conserving energy is as easy as turning off the lights, TV and computer when you’re not using them. Switch to energy efficient light bulbs and Energy Start appliances. Run the dishwasher and washing machine with full loads (or consider drying the laundry outside on a clothesline). And when the temperature dips during the colder months, before you crank up the heat, consider putting on a sweater, tossing another blanket on the bed and keeping a nice, warm throw near the sofa when it’s TV time. Snuggle up and stay warm! When it comes to keeping the air clean in the area we all call home, every little bit helps. You can make a difference.